Oprah Winfrey sparked an age-old debate with her TV special on OWN called “Dark Girls” this past Sunday. The TV special caused a social network uproar with the trending topic #Darkgirls. If it was up to me I would have called it something like #Allgirls to diffuse the biases, as all women and even men are effected by this issue. The topic of colorism has always been a big deal to me and I thought this would be the perfect time to introduce it. Colorism is the discrimination in which human beings are indifferent based on skin color. Ironically this is found among people in the same ethnic group and can be found all around the world. Slavery lasted for about 246 years, but has affected us for so much longer. After being so dehumanized and looked down upon it was so hard for us as Black Americans to come out strong from that. It was one thing to be free, but we were still treated less superior than white people. We were actually looked at as “monkeys” or “apes.” Blue blood test were done to determine how superior you were. If you looked at the veins in your wrists and could see blue, then you had “royal blue blood”, meaning you were more worthy than someone who could not see the blue in their veins. All of these myths were ridiculous because clearly all of our blood is blue and “royal” as they would say. “The darker the flesh the deeper the roots” -Tupac. Some people believe that the darker skin tone you have, the closer you are to being “African” and that this is a negative correlation. We have been brainwashed since slave days to believe lighter is superior to darker skin. During slavery the darker you were the more work you had to do. The darker skin blacks were in the fields doing work outside, while the lighter skin ones were doing house work. Other tests like the “brown paper bag test,” “the comb test,” and “the flash light test” were conducted in black communities. All of these tests were used to determine how Black or African a person was, which would then determined their worth. The brown paper bag test used a paper bag to compare to ones skin color and determine if you were “too dark.” The comb test was used to see if a black girls hair was too “nappy.” They would take a comb and if it doesn’t smoothly go through your hair, you have “bad hair” and are seen as worthless and ugly. All of these tests would bring down a persons self-esteem, performance, and create less opportunities for them socially and economically. Looking at criminal statistics, a sentence for a darker black American is longer then that of a white or light skin person who did the exact same crime. Colorism just isn’t in America however. It is also in Africa, India, China, and South America. In these countries they practice something called “ skin bleaching” where they literally use products for the skin with bleach to make them lighter. Woman and men all around the world force a lighter skin tone on their skin not thinking about all of the health risks. Some skin bleaching products are called Ambi, Makari, and Black Soap. These products are ironically used the most in countries and continents like Jamaica and Africa, where majority of the population is black. The dark skin people in these countries feel as though they will have a better chance at life if they were lighter. The media has one of the biggest effects on African-Americans today also; all you see and hear in hip hop music is about how light is right. The music videos are filled with light skin women and long hair and lyrics praising them. When all you see getting glory is light skin woman, how do you think it makes a woman of darker skin feel? Men and women of lighter skin are also affected by this prejudice; they are often thought to be conceited or cocky because they have a fair complexion. Children have no shame in their game; they will tell you or show you exactly how they feel without thinking twice. “The Doll Test,” is a famous test that has been done on children since the 1940s. This test started with psychologists Kenneth Bancroft Clark and his wife Mamie Phipps Clark. They conducted a test to show how segregation has damaged black children. In this test they showed the dolls to black children between the ages of three and seven and asked them questions to determine their racial preference. Most of the children chose a white or lighter doll, and gave that doll positive characteristics and gave the darker dolls more negative characteristics. It’s so crazy for a black child to choose white doll to be the “good doll” and a black doll to be the “bad doll.” The Clarks also gave the children outline drawings of a girl and boy and asked them to color the outlines the same color as themselves. Most of the children with dark complexion did not color the figures that way they used lighter colors. 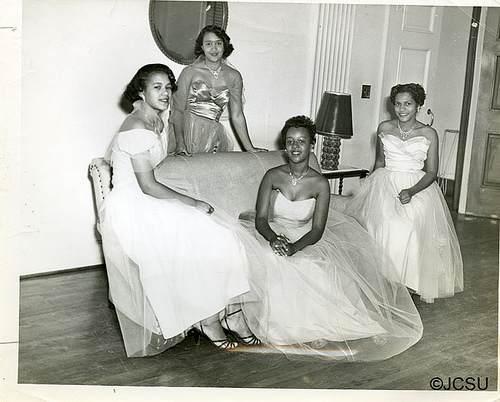 The Clarks concluded that “prejudice, discrimination, and segregation” made black people develop self-hatred and feel lower than someone of lighter complexion. From the beginning of time African Americans have been inferior to whites, when we finally are free we are still being suppressed. It’ll take years for prejudices and racism to completely disappear but I believe we can work on it first by accepting ourselves, our skin tone, or hair, and our lips. We have to show everyone that all races are equal and erase our past and better our future. A question I have heard being asked during many presentations on colorism is “Do you think Obama would be president if he was of darker skin?” Think about all of these topics and how you personally view yourself and others.